(AP) ISLAMABAD - Pakistani lawmakers elected a ruling party loyalist as the new prime minister Friday, despite corruption allegations and his failure to end the country's energy crisis  setting in motion what is likely to be a short and turbulent premiership. 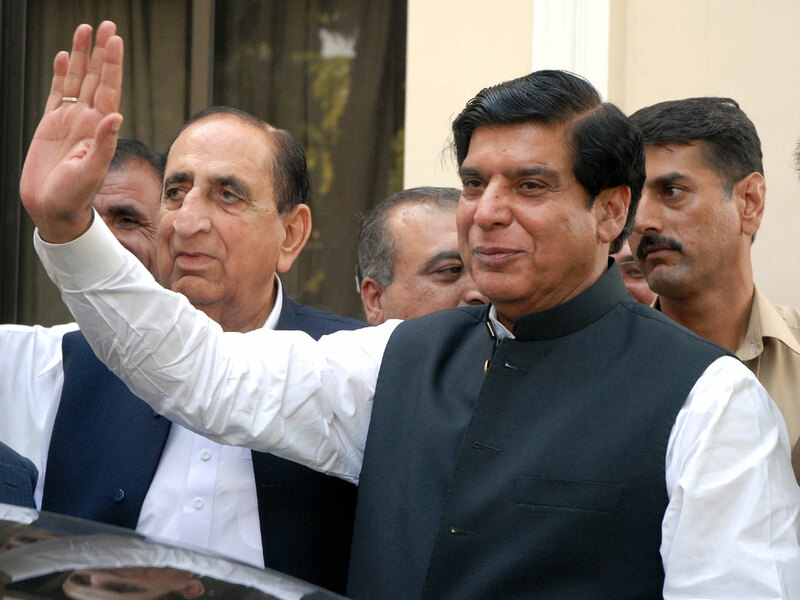 The election of Raja Pervaiz Ashraf is unlikely to reduce tensions among Pakistan's jostling power centers that are destabilizing the nuclear-armed country, which is considered crucial to American hopes of winding down the war in neighboring Afghanistan. The latest round of turmoil was triggered earlier this week when judges at the activist Supreme Court disqualified former Prime Minister Yousuf Raza Gilani for refusing to initiate a corruption investigation against his boss, President Asif Ali Zardari. The court, considered by many to be hostile to Zardari, is likely to make the same demand of Ashraf, and many are predicting he will meet the same fate as Gilani within months. Ashraf, a minister in the ousted government, was originally put forward as a backup candidate but got the nod after the first choice was hit with an arrest warrant following his nomination on Thursday. The warrant was issued by an anti-narcotics force run by the military, which wields political power and has staged three coups in Pakistan's short history. Ashraf was elected prime minister by Zardari's Pakistan People's Party and its coalition parties in an early evening session. The government's term was scheduled to end in March 2013, but it is now expected to end sooner because of the pressures on the coalition. A senior PPP member, Khursheed Shah, said earlier Friday that general elections would now be held this year. "This year will be the year of new elections, and we are going for the elections," he said. The corruption case against Zardari was initially heard by Swiss legal authorities in the 2000s and dates back to allegations that Zardari laundered state money there in the decade before that. Critics say that by pressing the case, the court is taking on a political role, threatening the democratic process in a country where elected governments have traditionally been squeezed by army, often in league with a partisan court. The court's supporters say activist judges are needed to keep a check on rampant corruption and misuse of power by the government. They point out the court has also been carrying out investigations into human rights abuses by the military. Ashraf was head of the water and power ministry for three years, an unpopular position in a country where daily blackouts in the steamy summer can be as long as 22 hours. He has been accused of corruption relating to power projects. Ashraf oversaw the import of short-term power stations, or "rental power" projects that cost the government millions of dollars but produced little energy. The policy earned him the nickname "Raja Rental" in the Pakistani media. He denies any wrongdoing. He was ridiculed by the Pakistani public for often claiming that the power crisis would be over soon, only to have conditions get worse and worse. The PPP likely chose Ashraf because they knew he wouldn't last long in office. When Shah was asked about the corruption allegations against the new candidate, he said allegations are leveled against many people, but no charges have ever been proven against Ashraf. The political jockeying for power likely means Pakistan's more weighty problems will fall off the agenda until a new government is established. The country's economy is in shambles. The military is fighting a violent insurgency in the tribal areas near the border with Afghanistan. In many parts of the country, residents receive only a few hours of electricity a day, setting off riots earlier this week. Pakistan and U.S. relations are also at an all-time low. The U.S. accuses Pakistan of not going after insurgent groups operating in its tribal areas while Pakistan says the U.S. doesn't give it credit for the losses it has suffered fighting al Qaeda and other militants.